An online resource offers Wisconsin residents a new option for reporting elder abuse. 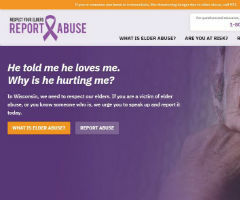 The website, www.ReportElderAbuseWI.org, is the next phase in the Wisconsin Department of Justice’s campaign to raise awareness about elder abuse and encourage citizens to report abuse against seniors. According to the Wisconsin Bureau of Aging and Disability Resources, the number of reported elder abuse cases has been on the rise, more than doubling over the last 15 years. There were 8,031 reported elder abuse cases in Wisconsin in 2016. The attorney general also started a new pilot program in Brown, Outagamie and Winnebago counties that allows Wisconsin residents who suspect a caregiver is abusing their loved one to use a covert camera to provide surveillance over someone who may have been harmed by a caregiver in their residence. Currently, the “Safe Seniors Camera Program” is only available in those counties. Schimel has prioritized elder abuse, launching the Attorney General’s Task Force on Elder Abuse in August 2017. To report suspected financial, physical, emotional, or sexual abuse, please contact your county elder adult-at-risk agency or call 1-800-488-3780. If you witness an act of abuse, neglect, or exploitation that requires immediate attention, please call 911.